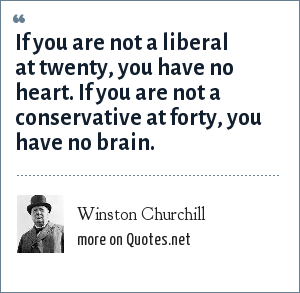 Winston Churchill: If you are not a liberal at twenty, you have no heart. If you are not a conservative at forty, you have no brain. "Winston Churchill Quotes." Quotes.net. STANDS4 LLC, 2019. Web. 23 Apr. 2019. <https://www.quotes.net/quote/37629>.